The vast majority of Nice's coastline is taken up by public beaches, open all year, all the time and free to use. Clean, safe, and well-maintained, Nice's public beaches are much beloved by the local population. Rare are the Niçois who frequent private beaches. Mostly, you'll find the locals in the morning, chatting on the beach and then heading home for lunch before the sun is high in the sky. Beau Rivage, Forum and Fabron beaches all have indoor hot-water showers,telephones and restrooms that you can use for a small fee (see photo left). With an entry on the Promenade, the facilities are monitored and well-maintained--not at all grotty. These public facilities are open daily from mid-May to September but weekends only the rest of the year. Beach thieves do ply their trade, concentrating their efforts during the summer and in the more centrally located beaches. Portable phones are a particular target. Without succumbing to paranoia, if you're going for a long swim, it's best to get someone to watch your valuables. 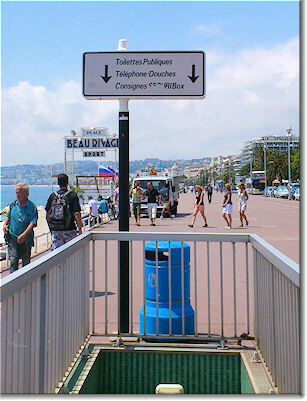 There are at least two outdoor showers and a tap on each public beach in Nice. The water is cold and you are not allowed to use soap, shampoo or detergent. For a hot water scrub-down , you can use one of the paying indoor showers at the public facilities (above left). In addition to the paid restrooms on the Promenade (above), there are also public toilets (beach entry) on Centenaire and Blue Beach open in the summer. There are also portable toilets stationed on most beaches in July and August.